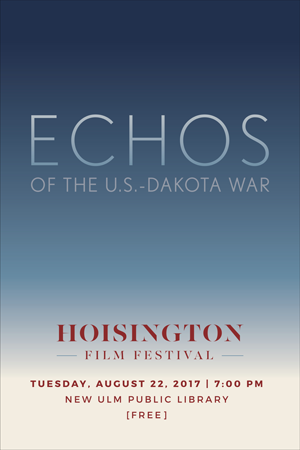 On Tuesday evening, August 22nd, the Brown County Historical Society and the New Ulm Public Library will host the Hoisington Film Festival. It begins at 7 p.m. at the New Ulm Public Library and admission is free. That is a traditional week set aside for lectures and tours about the U.S.-Dakota War of 1862. The evening will feature three short films. Never Shall I Forget is the story of the battles of New Ulm told completely through the words of participants. It is featured in the BCHS Erd basement installation, but it has never been shown elsewhere and never on a large screen. The second film is Turner Hall 1862. The Turners were the driving force behind the settlement of New Ulm. They were idealists who had a vision of the type of society that they wanted to build here. Did they succeed? This documentary will look at the Turner Hall on the eve of the battles of New Ulm. Finally, we’ll present The Truth in History: Remembering Elden Lawrence. Dr. Lawrence was a fine historian who through his abilities and compassion taught others about the U.S.-Dakota War. The evening concludes with a question-and-answer session. Posted in: New Ulm, New Ulm Turner Hall, Pastcasts, U.S.-Dakota War of 1862.